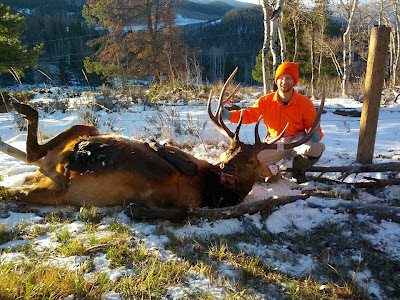 Fru-Gal.org: God Provides: A Freezer Full of Organic, Grass-Fed Elk Meat! God Provides: A Freezer Full of Organic, Grass-Fed Elk Meat! My awesome hunter got this 12 point elk up in the Rockies while on an 8-day hunting trip! Our 6th anniversary is tomorrow and my gift is a freezer full of organic, grass-fed elk meat (doesn't taste too much different than beef). What a blessing!